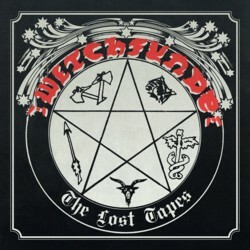 Released last year by the band’s original bassist Andro Coulton on his own Viper label as ‘The Lost Tapes Of 1975’ Witchfynde’s first demo has been spruced up for release as a double-vinyl set through Bad Omen Records. This first demo was recorded in Leicester in December 1975 – the same month, the biog helpfully re-iterates, that Steve Harris formed Iron Maiden – and although nothing from the session went on to make their 1980 ‘Give ’Em Hell’ debut album, you can hear the roots of a number of that album’s songs in these early recordings. Recorded live in the studio the cuts are very much tentative steps along the way, very much in the mould of early Seventies rock (and sometimes – ‘Slow Down’ being an obvious example – very much in need of an edit to keep them focussed), but Montalo’s precision playing and Steve Bridges’ distinctive voice ably cement them to the likes of ‘Leaving Nadir’ and ‘The Divine Victim’ from their debut recorded just a few years later. In addition the collection adds two more cuts recorded in a Coventry studio – the name and date have been lost to the ages of the ages – including an early version of stage favourite ‘Tetelestai’ (which had been recorded properly at the time of the debut but which remained unreleased until unearthed for the first time on its 2004 re-issue), and from the same session comes ‘Valkyrian Ride’. The quality drops off for this final pairing, but 18 or so months down the line you can hear Witchfynde really coming together as songwriters, and it’s a great shame that ‘Valkyrian Ride’ in particular fell by the wayside and didn’t go on to bigger and better things. As noted above, this is a vinyl only release, although it’s also worth pointing out that the tapes have been beautifully restored and do sound considerably better than the original CD version.